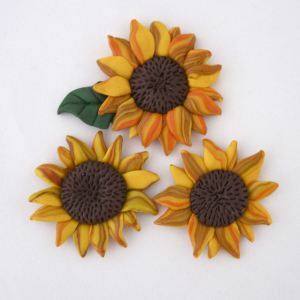 There’s nothing like a lovely sunflower craft to ensure your home will be bright and summery even on cloudy August days. 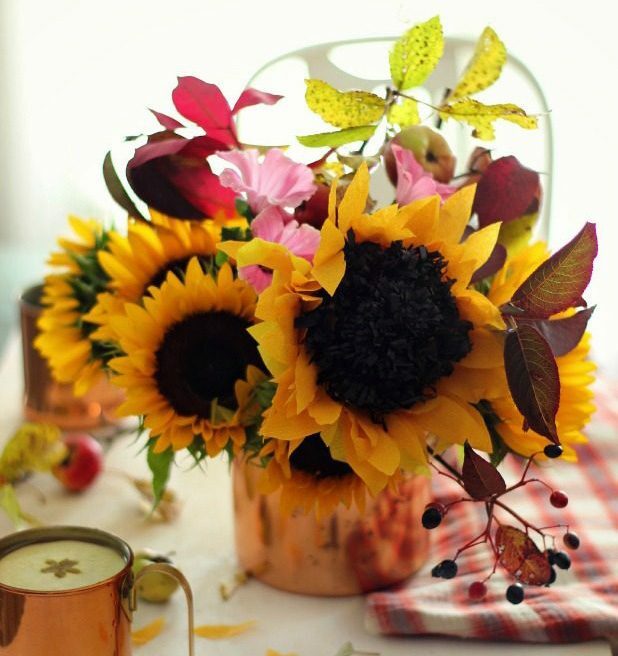 The best things about DIY flowers? They never die, AND you can make them out of nearly any crafting material. Do you some lovely yellow felt sitting around, or sunny crepe paper? 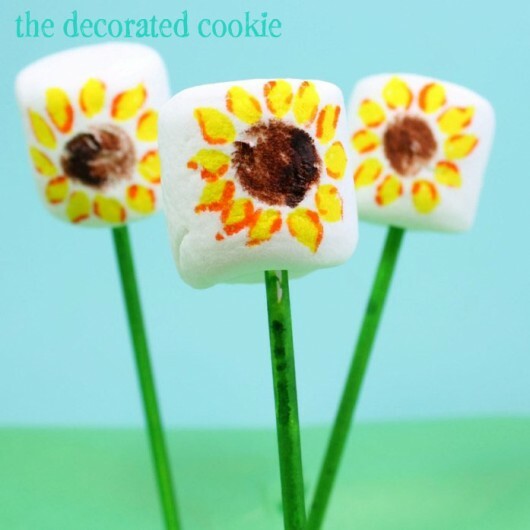 Then you’re going to love this list of sunflower crafts from a group of bloggers we’re sure you’ll love even more. 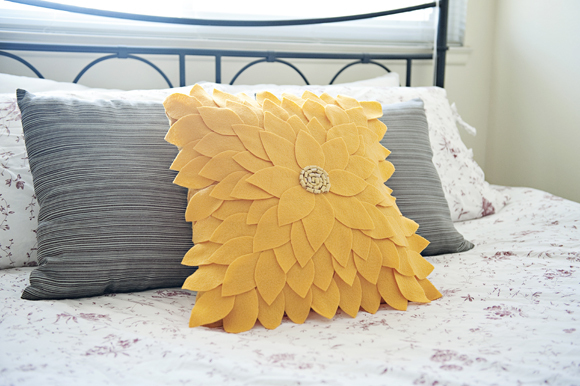 Which sunflower craft will YOU choose to brighten up your home with? 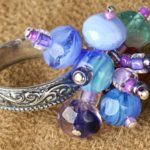 Last week I put forth a little contest for bloggers–I asked you to add a link to FaveCrafts on your blog and enter our linky list, and one blogger would win a feature in our newsletter (and this blog post!). We got a lot of great entries, so make sure you check all of them out! Thank you to everyone who participated. We’ll definitely run this one again sometime. Here’s what I posted in the newsletter. To see everyone who linked up, check out our blog post and linky list! The winner of the linking contest was Suzannah from Adventures in Dressmaking! Congrats, Suzannah! Make sure to check out her blog to see all of the crafty things she posts. 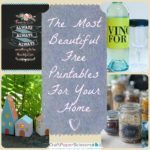 Thanks again for all of the fabulous bloggers who participated! Link Contest Recap: Whose Blog Won? But who was the number 1 blog I chose? You’ll have to subscribe to the FaveCrafts newsletter and find out some time in the next week! Thank you to everyone who participated! Welcome to the seventh (and final) issue of the FaveCrafts Craft Rooms Exposed series! As promised in our monthly craft question post, we have featured the inside of your favorite designer’s craft rooms every Monday. 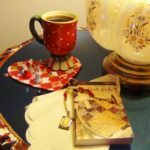 I hope you got plenty of insider tips, inspirational ideas or just pain had fun reading these posts! And now without further adieu, let’s explore our final featured craft room. Until next time! Thoughts on Organization: Getting organized was definitely my major New Years Resolutions this year. I spend most of my free time working in my studio area in my apartment. I was in my spare bedroom and was outgrowing it. So I went with a rather unconventional approach. In my apartment the living room and dining room are one open area. I made my living room my studio. I have my computer desk, art supplies, sewing machine, bookcases and storage in this larger room. I put my former dining table in the middle of the room for a work table. The former dining room is now a small sitting room with the TV and stereo attached to the studio area. This arrangement probably wouldn’t work for most people, but I live alone, so I figured why not? I have been so much more productive and I am really glad I made this change. I think at first most of my friends and family thought it was a crazy idea, but the get it now. I love it. I love using unusual items for storage. I have vintage suitcases that I organize and keep my patterns I design in them. I use old cigar boxes for ribbons and trims. I have a pink cupcake theme I am working on, so I have found glass covered cake plates for display. 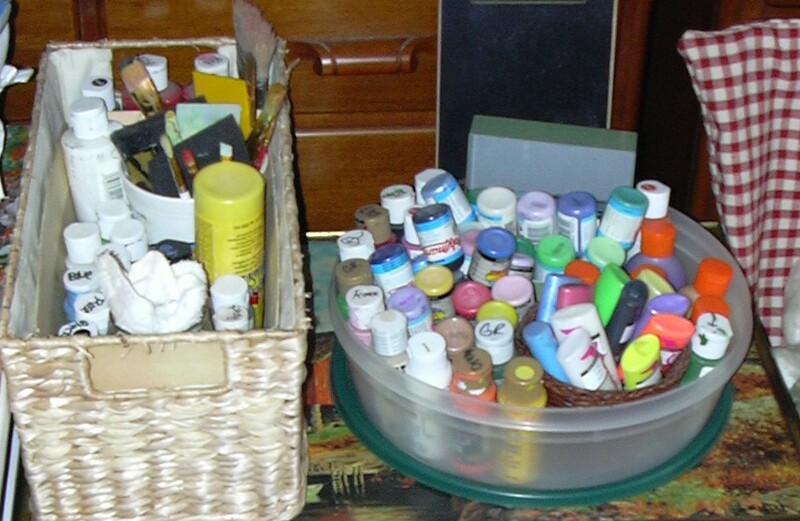 On my work table I have a cake plate with containers with my art supplies. The really pretty Valentine Candy boxes are great for storing beads too. I have attached a few photos. Thanks for giving me the opportunity to share. Welcome to the sixth issue of the FaveCrafts Craft Rooms Exposed series! As promised in our monthly craft question post, we will be featuring one craft room every Monday. Get inside tips from some of our favorite bloggers and designers and find out how they turn their craft rooms into lean, mean crafting machines! And now without further adieu, let’s explore our latest featured craft room. Organizational Tip: I have turned my garage into a Stamp room. To see the rest of the tour, visit Debbie’s Blog. 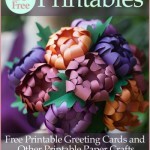 Welcome to the fifth issue of the FaveCrafts Craft Rooms Exposed series! As promised in our monthly craft question post, we will be featuring one craft room every Monday. Get inside tips from some of our favorite bloggers and designers and find out how they turn their craft rooms into lean, mean crafting machines! And now without further adieu, let’s explore our latest featured craft room. Organizational Tip: I just reorganized my craft room, yet again, by purchasing more plastic bins and shelves and adding an extra table. For me to create, I need things easily accessible and I need some sort of organization. For instance, I have a bin with three drawers that has “in progress” hand painted papers, “ready to alter” hand painted papers, and “ready to frame” hand painted papers. Then I have a bin with three drawers for hand painted papers that I sized. Each size is then placed into a baggie and labelled…right now I have 2×2, 4×3, and 5×7 cut papers. I also have bins with drawers for tags, mulberry papers, store-bought papers, and scrap papers.I can buy the bins from Wal-Mart and Dollar General from $4 to $15 a pop and the shelves from Wal-Mart for $20. Because they are white, they brighten up my dungeon (my art room is in the basement next to my office). And because the bins are see-through, I can see at a glance where things are saving me time when I need something specific. Welcome to the fourth issue of the FaveCrafts Craft Rooms Exposed series! As promised in our monthly craft question post, we will be featuring one craft room every Monday. Get inside tips from some of our favorite bloggers and designers and find out how they turn their craft rooms into lean, mean crafting machines! And now without further adieu, let’s explore our first featured craft room. Organizational Tip: No matter how much space you have, the key is to get some stackable containers and organize your crafting items. You can also label them so you will know exactly where everything is when you need something. Welcome to the second issue of the FaveCrafts Craft Rooms Exposed series! As promised in our monthly craft question post, for 8 more weeks we will be featuring one craft room every Monday. Get inside tips from some of our favorite bloggers and designers and find out how they turn their craft rooms into lean, mean crafting machines! 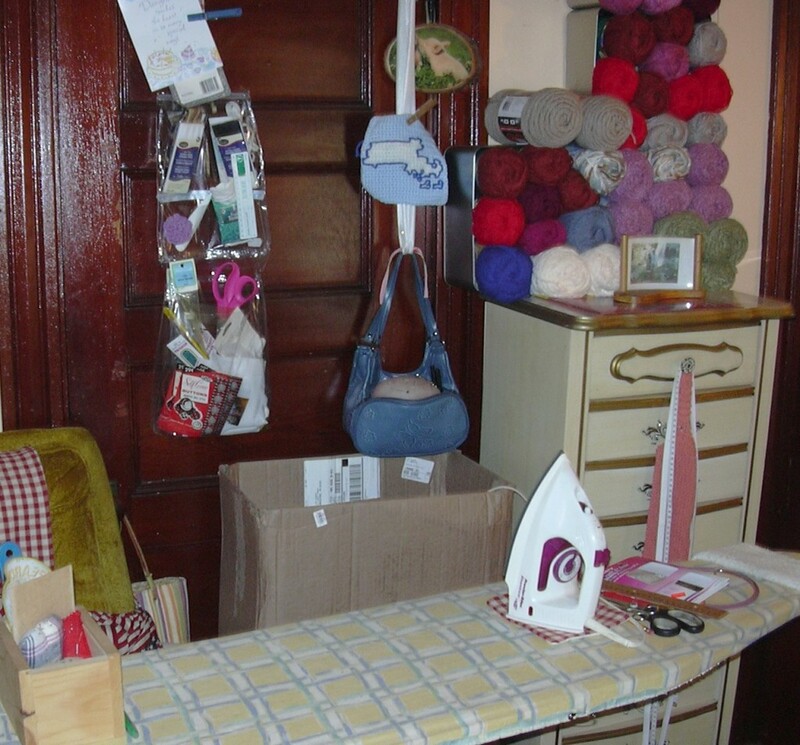 And now without further adieu, let’s explore our first featured craft room. Jane says, “I love to re purpose containers when possible. We love clementines and use the boxes to store craft items. They are great because we can stack them in the large cupboard and if we are doing a particular craft, we can grab the entire box and bring it out closer to where we are working. We also love cigar boxes. (No, we don’t smoke cigars, but found a bunch in Myrtle Beach years ago that we are still using. I love the colors – and the smell!). Want to see more? Check out this awesome post written by Jane. 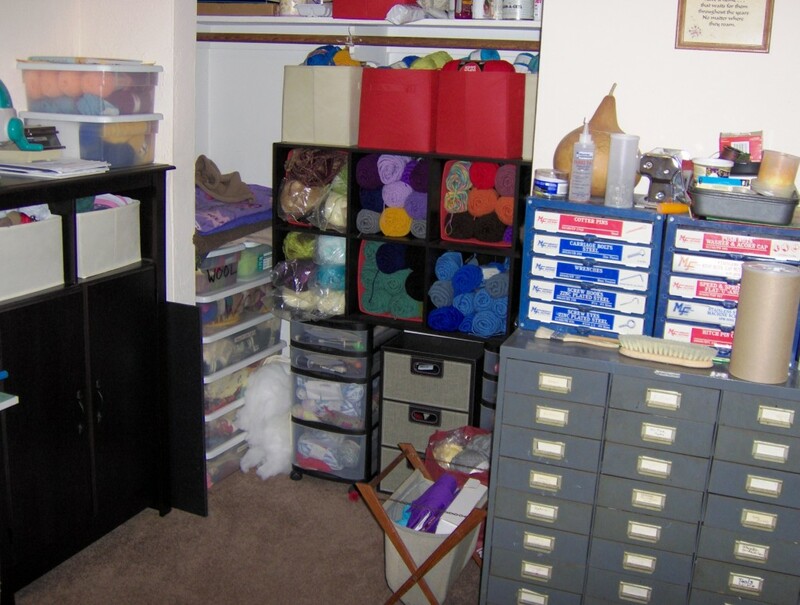 Organizational Tip: Berta says: I organize my craft room so that I can see the materials I want to work with easily. I make things stackable so I have room to go up. Berta says: The gray slot file chest is in alphabetical order. Inside is paint, glue, and other small crafting materials. The hardware drawers above it are for bead work. The storage case with red containers are for the yarn and the transparent drawers underneath them hold all of my needlework supplies. I have two black chests that hold all computer patterns, craft books and paper. This seems to work well, but I never have enough room! Don’t forget to stop by next Monday for a new tour with new tips! 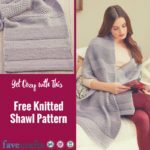 Welcome to the very first issue of the FaveCrafts Craft Rooms Exposed series! As promised in our monthly craft question post, for 9 weeks we will be featuring one craft room every Monday. Get inside tips from some of our favorite bloggers and designers and find out how they turn their craft rooms into lean, mean crafting machines! 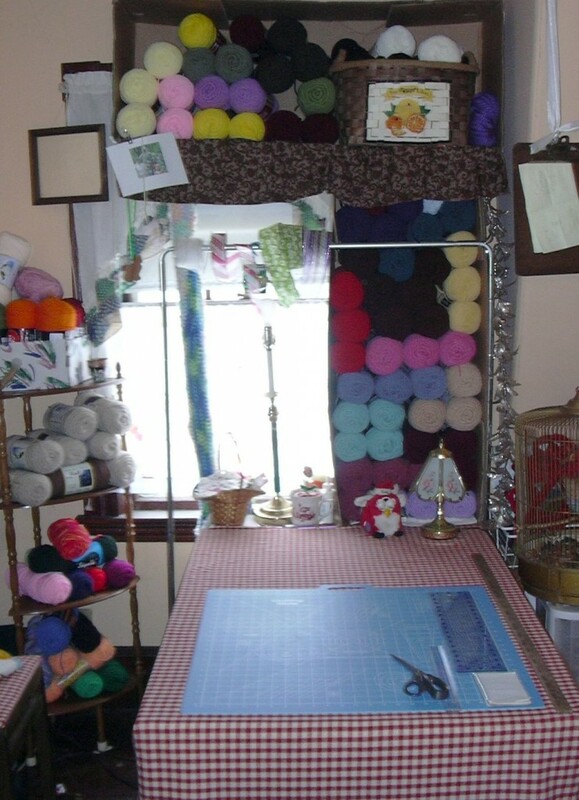 And now without further adieu, let’s explore our first featured craft room. Organizational Tip: You don’t have to break the bank to have a functional and creative work space. You can have a creative space that makes you happy and spend very little money creating it. 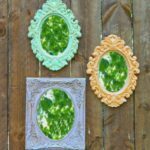 I want to share My Green Craft Room with you. I am very thrifty and love to recycle any chance I get as you will soon see. I’m also known to be very unique. My craft room is a far cry from fancy but I love it and everything thing in it inspires me to be creative. I hope my craft room will inspire you to create your own creative space in your home. Tina says: It is amazing what you can do with two card board boxes and a folding table! 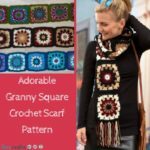 Cover that support post with crochet grafitti! A clipboard hanging from the ceiling makes a great place to put current project notes! Tina says: The packages my curtains came in turned into a handy hanging holder for my sewing doo-dads. My old pocket book turned into a pin cushion with scissor and ruler storage. Tina says: Baskets and plastic containers make for great storage. Store your fabric paint upside down in a plastic container and your arm won’t fall off from trying to shake the paint to the tip. For more great tips from Tina, make sure to read her blog post about her craft room. Be sure to check out our free eBook, How to Organize Your Craft Room: 15 Room Tours and DIY Organization Ideas from Your Favorite Bloggers for more great tips! What craft room organization tips do you have to share?